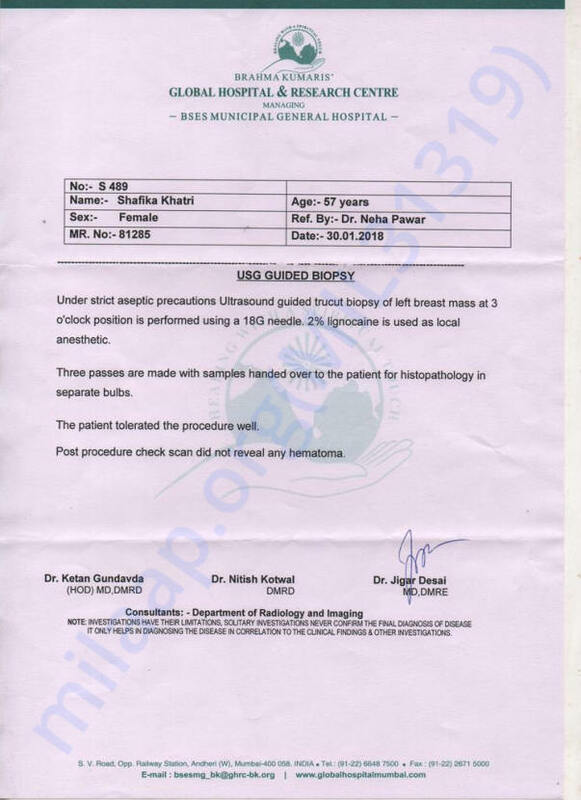 My 57 years old Aunt (Bua) Shafika Khatri's left breast started releasing lumb in November after which she was diagnosed with Breast Cancer. She has been unattended since then. 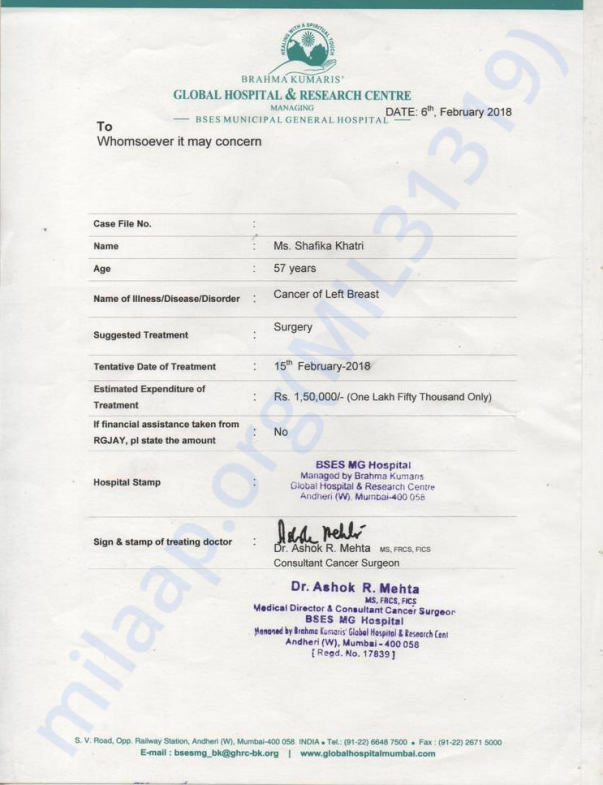 We need to get her operated as soon as possible in order to prevent spreading cancer in major areas of her breast. My bua cares about me more than my mother. I met with an accident 2 weeks ago & she was the only person who was worried about me. All I have is my bua and I can't see her in so much pain. We are struggling hard to arrange help for her and give her relief from this pain. She was crying and extremely scared the day we went for her Biopsy. She was trying to avoid her Biopsy but I have to stay strong in order to give her the strength to handle everything during this difficult period. Our poverty is the only thing standing in her way so we desperately need your help. Due to financial issues her treatment is still pending. As she is unmarried she cannot afford operation expenses. All close relatives have abandoned us. We dont even have any male members supporting us. Our poor financial condition makes us feel even more helpless. We are struggling with this all alone. At this difficult situation she only has me and my sister. We have no earning member to help us at this time. 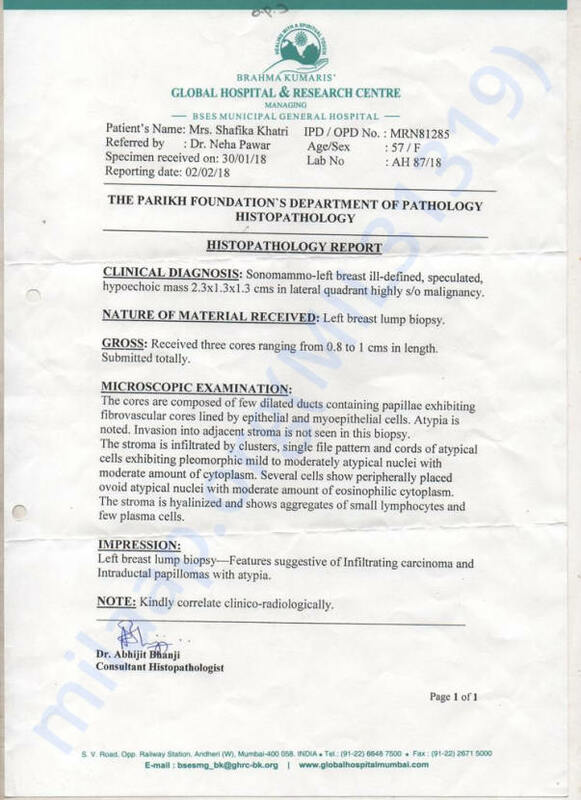 I am looking for financial support to get timely treatment for my aunt. Its been a while since her operation has been pending and we can start the surgery as soon as we get close to 2 lakhs. Please help us out by contributing here and help my aunt. The funds will be utilized for the Surgery, Chemotherapy, Medical Tests, Medicines, etc. Your Small Contribution will make a big change in our life. We will share regular updates to inform you how the funds were utilized. Thanks for your support. 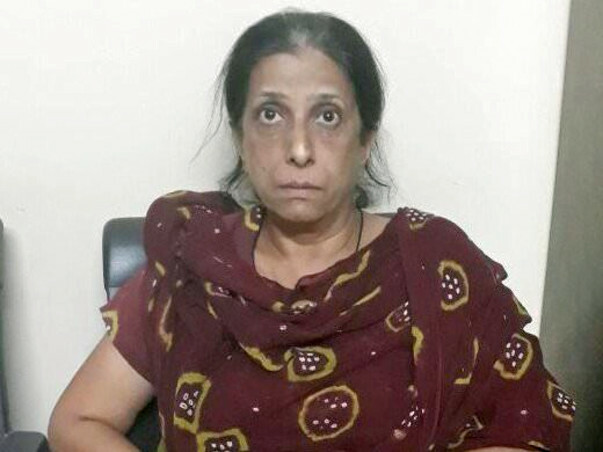 Bua faced constipation problem after operation Dr. Said that is very much normal.. it happens due to antibiotics. Those 5 days were really tough for me & my sister. The surgical drain was also removed on Tuesday, 13th March 2018. Finally, on 13th March 2018 she was discharged & she's fine now. Her stitches were opened on 17th March 2018. Will get reports of Tissue (breast) test within a week by which we will come to know whether Chemotherapy is required or not. As informed by Doctors Bua will be on heavy medicine for continuous 6 months from now. I will keep you regularly updated as soon as I get all the reports and other information. Thank You, Everyone, for you immense love & support. Thankyou for your support. We have almost accomplished our goal. We just need a little bit more. We had visited hospital yesterday Dr. Ashok Mehta informed us that there are some test to be done before operation. So today we went along with our Bua for remaining Test. After getting these test reports Dr. Ashok Mehta will schedule operation date. Dr. Ashok Mehta even informed us that chemotherapy are required or not that will be decided after operation as the tissues will be tested first.